There is no doubt that exercising during pregnancy can be difficult to accomplish. You are TIRED, so very TIRED! You just want to sleep. It is hard to take a walk when every step makes you want to puke. And it is really hard to even move when your sciatic nerve is acting up. With this all being very true for many pregnant women, it is still vital for the health of your pregnancy and for stamina in labor to keep in shape. The March of Dimes recommends 30 minutes of exercise a day for pregnant women. Even 20 minutes of exercise 3-4 days a week is beneficial toward having a healthy pregnancy and vaginal birth. As with all aspects of life, exercise is very beneficial to pregnancy. Exercise maintains muscle tone, improves mood, normalizes blood pressure and glucose metabolism, helps regulate digestion/elimination, improves body image, helps with sleep and prevents unnecessary weight gain. Women need stamina for labor; a regular exercise routine will help her stay physically strong and less fatigued during labor. Exercise improves blood flow through the placenta by 30%. Some women already exercise regularly. It is ok to continue that routine in the beginning of pregnancy and see how it goes from there. Even exercise that seems extreme for some women could be ok for very fit pregnant moms. Running and weight lifting are 2 good examples of exercise that would not be recommended for a mom who was not previously exercising but is perfectly ok for one who had been. Up until 20 weeks, women can do abdominal work. After 20 weeks, as the rectus abdominis muscles begin to separate to make abdominal space for the growing uterus, doing some ab exercises will become uncomfortable, sometimes even painful. This does not mean that a woman should just let go of all abdominal control. She should continue to stand up straight and hold her belly in for as long as possible. This will help prevent discomfort later in pregnancy. Any exercise that could result in a fall like horseback riding, biking or skiing, should probably be avoided after 20 weeks. A mother should be more cautious as pregnancy progresses with weight lifting because the hormones that relax and soften the woman’s body to accommodate the pregnancy and birth, can possibly allow injury to her joints or her back. These type of injuries are painful and a pregnant woman has few options for pain management. Women may be unable to exercise in the first trimester because of concerns or symptoms in their pregnancy, things like bleeding or cramping, excessive nausea and/or vomiting or feeling too tired to exercise. That is fine but this sedentary lifestyle should end as soon as these concerns resolve. Toward the end of pregnancy, many women start to feel the need to slow down. This is reasonable of course. Excessive fatigue or just feeling unwell during or after exercise can be a sign that the current routine is now too much for a body that is already working hard at making a baby. Slowing down to just strolling and some mild calisthenics is still a good workout after 34 weeks. A woman’s care provider may recommend that she stop any kind of exercise toward the end of her pregnancy because of complications developing like blood pressure disease or preterm labor. On the other hand, she may be advised to increase her activity to help control her weight gain or gestational diabetes. Gestational diabetes is a cause for concern in pregnancy and definitely increases the likelihood that a surgical birth will occur. The placenta secretes hormones that fight against the action of insulin. Insulin works to remove excessive sugar from the bloodstream as quickly as possible so the placenta creates insulin resistance to make sure that the baby gets enough sugar before it is stored away by the mother’s body. A diabetic state in the mother is created when her body cannot overcome the resistance and blood sugars are high and stay high for too long. The baby will grow larger and will grow in a manner that could cause the baby to be larger in the chest and abdomen than usual. Babies’ heads are typically the largest part of the baby so once a woman delivers the head, the rest of the baby slips right out. In the case of GDM, the baby might have a harder time delivering its body after the head and that is potentially dangerous for the baby. Uncontrolled Gestational diabetes can cause the placenta to age more quickly, creating an increased risk for stillbirth. GDM increases the risk for cesarean because the baby may grow too large to fit through its mother’s pelvis and because of the risk of stillbirth, labor may be induced as early as 39 weeks. Induction of labor is definitely a risk factor for cesarean birth. Regular exercise, especially from the beginning of pregnancy, decreases insulin-resistance and so helps the mother to maintain a more normal blood sugar level, perhaps even preventing a woman from being diabetic at all. Regular physical activity before conception reduces your risk for gestational diabetes by 55%! And… regular physical activity during early pregnancy decreases the risk for gestational diabetes by 24% (Source). Although no studies have indisputably shown that exercise reduces the risk of PIH or Pre-eclampsia, it is known that exercise can reduce blood pressure overall. So a woman that enters pregnancy in good shape from a regular exercise routine is unlikely to have hypertension as a pre-existing condition. Chronic hypertension is a risk factor for pre-eclampsia. Both chronic hypertension and pre-eclampsia may necessitate induction of labor. If a woman is really unstable, she may need a cesarean section without an opportunity for laboring at all. Excessive weight gain during pregnancy is associated with poor maternal and neonatal outcomes including gestational diabetes, hypertension, cesarean section, macrosomia, and stillbirth (Source). Regular participation in [aerobic dance] exercise can contribute to significantly reduce weight gain during pregnancy. Sometimes it has to be said plainly, pregnancy does not justify eating to your heart’s content. As a matter of fact, it is a time where conscientious consumption of moderate quantities of nutritive foods is imperative. Since pregnancy may cause an increase in appetite, and many of us can’t help but eat when hungry, exercise helps burn excessive calories before they get stored. Cardio helps raise the metabolic rate in a pregnant woman and strengthens her heart and lungs. When a woman raises her metabolic rate, she burns more calories. This can be very helpful when she feels hungry all the time! Since pregnancy only requires 300 more calories than the woman actually needs each day (not the amount she usually eats, because most of us eat more calories than we actually need, pregnant or not), she will need to exercise to avoid excessive weight gain in her pregnancy. The increase in metabolic rate lasts for hours following a workout. Women are, in general, less fit than women used to be. Being really out of shape is a detriment to a healthy pregnancy and birth. Starting an aerobic exercise program while pregnant is a GOOD idea. The type of exercise should be mild and start slowly. Walking and water aerobics are exercises that most people can do even if they are out of shape. Lifting weights is a good way to maintain or gain strength in pregnancy. Weight lifting can be very safe. Using weight machines is recommended because the machines help keep muscles groups in their physiologic position. Women have “loose” joints in pregnancy and it is easier to injure them. The routine below is a sample from a body building expert, Hugo Rivera. Perform this routine 3 days a week with a day of rest in between. Do 20-30 minutes of walking on rest days. Use Modified Compound Supersets. Perform Modified Compound Supersets by performing the first exercise, resting for the prescribed rest period, performing the second exercise, resting the prescribed rest period and going back to the first one. Continue in this manner until you have performed all of the prescribed number of sets. Then continue with the next modified compound superset. Note: If by any chance you experience any type of abnormal conditions such as bleeding, sharp abdominal pain, loss of breath, exhaustion, or any other symptom that does not feel normal, contact your doctor immediately. If for any reason your doctor recommends complete bed rest, just continue your healthy eating and do not attempt to engage in any type of physical activity. Women who regularly practice yoga definitely have a strong tool in their wheelhouse to pull from in labor. Yoga prepares women for the discomforts of labor and teaches them to respond to the discomfort in a more productive manner; a kind of a Pavlov’s Dog effect can be achieved whenever the woman experiences pain. Yoga requires a person to put themselves into an uncomfortable position and then RELAX into the pain knowing that the pain is doing good work in her body. Labor is uncomfortable but less so when a woman is relaxed and accepting of the process her body must go through. Yoga makes for good labor rehearsal. Of course, there is a great workout involved too. If you are experienced at yoga, you may not work up much of a sweat but a novice does! The flexibility acquired is great; muscles become toned and some positions help move the baby into an optimal position, such as the cat and cow position, or help to strengthen the woman in a squat. This type of exercise will help a woman stay strong without overly exerting herself. Stand with left hand on wall and hold right ankle with right hand. Using wall for balance, pull gently back until you feel a stretch. Hold for 30 to 45 seconds. Repeat with other leg. Do this three times with each leg. Stand, placing your palms on wall. Put one foot behind the other. With back leg straight, slowly lean forward, slightly bending front leg. Relax, then move back leg a little father from wall. Hold 8 seconds. Repeat with other leg. Do this five times with each leg. Sit on floor with legs comfortably apart. Lean forward toward left foot. Hold for count of 10, then release. Do this five times with each leg. Lie on one side, lower leg bent slightly. Head can be up or down. Raise upper leg 12 or 18 inches, hold briefly, then lower. Begin with five lifts. Work up to 20 if it is comfortable. Repeat with other leg. Stand with feet shoulder-width apart and knees slightly bent. Contract muscles of buttocks and abdomen. Gently thrust pelvis forward, rotating pubic bone upward. Hold for 10 seconds, then release. Do this five times. Stand with upper arms parallel to floor and forearms pointing toward ceiling. Slowly bring arms together in front; hold five seconds. Then slowly press away toward back, squeezing shoulder blades together. Do this 12 times. Stand with arms straight out, away from sides. Move both arms in small circles for 60 seconds. Stop and relax. Repeat in reverse direction. Begin with three sets, work up to seven. Stand with arms straight out, away from sides. Move both arms overhead, as if doing a jumping jack, then return them parallel to the floor. Do this 10 times. Another important pelvic exercise is Kegel contractions, tightening and then releasing the same vaginal muscles that are used to cut off the urine stream. You can work up to doing this 100 or more times during the day. Five repetitions of 20 contractions or 10 repetitions of 10 will be more effective and less tiring than 100 done without stopping. Isometric exercises are done with by pushing or pulling against a static object like the floor or a wall or by using 2 body parts in opposition to one another like pushing your knees together as hard as you can and holding for at least 10 seconds. Press your palms together as hard as you comfortably can. Hold for at least 10 seconds, and repeat if desired. While sitting in a chair, deliberately tighten your stomach muscles, and hold your feet an inch or two above the floor. To increase the resistance, push your knees down toward the floor with your hands while trying to keep your feet from touching the floor. From a seated or standing position, clasp your hands behind your head, pulling your elbows out wide. Then try to push your head back using your neck muscles, while simultaneously trying to push your head forward with your clasped hands. This exercise works your upper back as well as your neck muscles. In a standing position with one hand against the wall to stabilize yourself especially as your belly grows, lift your left leg while keeping your knee bent so that your thigh is perpendicular with the ground. Then, use one or both hands to push your thigh down while continuing to lift it upward. Switch legs and repeat the exercise on the opposite side. 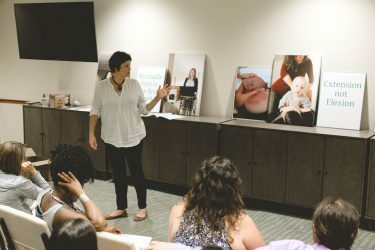 The benefit of a scheduled, in-person class is the comradery of other pregnant women. Knowing that someone is expecting you at class tonight or this morning might get you there more regularly. Sometimes it takes more discipline than you can muster to exercise alone at home, especially while pregnant. An online class could be a good choice when the weather is bad or you have very limited time to workout. The friends made at exercise classes could be good mates after the baby comes. There are postpartum “Baby and Me” classes that you and your “workout” friends might join together. Exercise! You will feel better, gain less weight, have a better mood and decrease your chances for a surgical birth. Avoiding Cesarean: What is a Doula? I am 7weeks pregnant. And, I am struggling with nausea and vomiting, also feels too tired whenever I tried to do household things. In addition, I used to do regular exercise before I concieved but now it’s not possible. Please do suggest me what sort of things I can do to stay active and enjoy my pregnancy.